Hello again! I talked about this recently on the marketing for owners.com podcast. 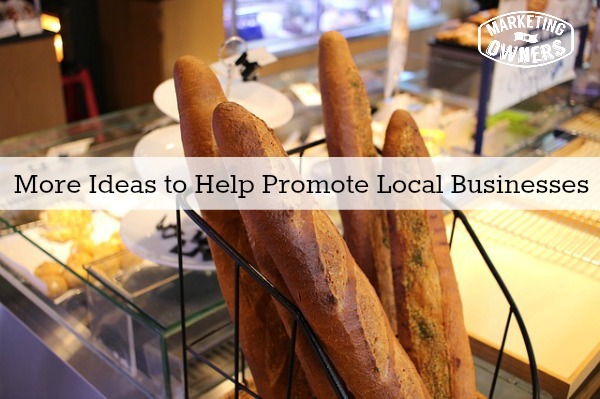 Local businesses can build relationships with other local businesses and what happens is you then leverage each others’ following so one promotes the other business to their customers and in exchange you promote the other business to your customers. If you can make that a 3 or 4 way thing then you’ve got a mini network, entire organization such as the BNI and so on a built around networking between businesses, but it doesn’t have to be like in that formalized way. You don’t have to get up at 6 o’clock and go and have breakfast with a bunch of other local business to do this just like BN. By the way, I don’t like getting up early. I’ll just never be the one. But you can make your own. It’s not that hard. For example, you may be a photographer and how about getting together with a real estate agent or realtor or estate agent for other countries with your different terms for the same thing? So, if you are real estate people you probably take photos. Do you want your photos to pop? Do you take them with your iPhone? Have you got a DSLR? But you have to look up on a manual, how to set up and so on. But how about getting a professional photographer to do that? This is not part of the business, this is part of marketing. Okay, this is not for you to get a real estate agent as your customer, this is for you to build a relationship with them and to get in front of their customers so you need to strike a deal as part of your marketing. So, what happens is you go and you say, “I would like to take photographs for you inside a house and to show you how I can make your houses look better. In exchange, I would like to give you some vouchers to give out to your clients and your visitors. Let’s say, these photos were taken by sunset, if you like to see what they can do for you offer a free voucher of family portrait in your own house or something like that then contact.” Okay, so what happens you then go to them, you take your photos, you make it look fantastic. You go to real estate agent and they say, “Hmm nice yes, I will do that.” And then in exchange perhaps you say,”Do you have something I can give to my clients so that we can do quick pro coil something for each other. Yeah, you can think these things out because you know your business better than I do, but how about some deal, some special offering for instance, the real estate agent then puts together some kind of open house or some kind of rents a room and house and puts some nibbles out in a buffet and I think puts all the details or other things and a photographer’s clients get a special invite to this cocktail buffet. You can invent things, see what I mean. For instance, how about commercial landscape gardeners getting together with commercial painters? If the company is prepared to spend that money on the outside in their garden, how about if the actual building doesn’t look quite so neat? The chances are, if they’re going to spend it making a garden good they’ll probably want to spend money to make the building look good so each does a deal with each other to be able to offer some kind of introduction or some kind of discount or some kind of buy one, you know paint five windows get a free door painted who knows what you do. You can figure these things out out. Dry cleaners and carpet cleaners not related in the slightest however, they both make people look great and feel fantastic. Feel fantastic in a new close, feel fantastic in a nice clean home. Surely, there is a deal there. If someone is going to pay it have their clothes dry clean instead of just throwing them in the washing machine and tumble dry, then I am sure they going to be proud of the way their house looks. How about a special voucher that you introduce? You say, “These are our friends, let me give you this.” Your carpet cleaners do the same when you get a carpet clean, “here is a voucher if you get two items dry cleaned, one will be free. Half price on your first cleaning.” Think, figure out yourselves. There are ways to make business happen without spending any money. So what is all about? And you make lots of friends. You can expand on this. We’ll come back with some other ideas later on. It’s Tuesday. It’s time for the tool box tip. Today my recommendation is Sidekick. Sidekick is from pops box and it integrates with your email, with Gmail, with Google apps with Outlook, pretty sure with whatever email are there. Are there others? With pretty much anything. Remember I’ve taught, you should be using Gmail anyway. How do I explain? It’s free. Oh, yeah by the way, it’s free. It integrates. It also pops up another one saying “they’ve just clicked on the link”. Now you are not going to send this with all your mail shots because you are not doing your mail shots from that. You’re doing that from aweber or mail chimp or something. This is for your ordinary emails. When you send a quote to a customer imagine if you know that they’ve opened it and they’ve clicked the link, when they don’t reply perhaps you phone them and you know. You are not going to say, “I’ve been spying on you and I know but you know”. But you know they’ve clicked, you know they’ve read it, you know what you are talking about is relevant, it’s on their mind. Get sidekick.com. Honestly, I’ve been using it for the last week or two, it’s great. It’s really addictive. It’s really addictive and it’s been a great help. Try it, that’s all I ask. This is only recommended for you, doesn’t help me. Honestly, all this stuff works. How could you get businesses on board to promote you?